StepUp allows you to walk up one block height without jumping. This is a client sided mod. It works on both Singleplayer and Multiplayer servers. Press "J" to switch between modes in-game. The key-bind can be changed in the controls menu. StepUp for Minecraft 1.10+ allows the player to cycle through 3 auto jump options using the StepUp keybind. - If you have an older version of the mod for the same Minecraft version, delete it before running. 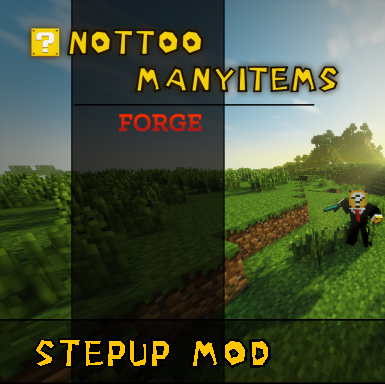 Feel free to use StepUp in modpacks. I love it! Is this allowed on Hypixel? Or the Hive? I have no idea. Try walking up a block a few times and if you can't stay on the block then it can't be used on the server. Most hubs don't have anti-cheat plugins that stop you from walking up a block so make sure you try in a world that isn't a main hub world. I really hope this mod will get an update for 1.13 and so on. Auto jump is way better using this! It's a good chance. Although I haven't played in a few years myself, I still have my eyes on the progress of Minecraft. I noticed in the latest update this mod prevents you from sneaking on blocks, you just fall off like sneaking wasnt a thing. Does this happen every time you sneak near an edge? What mc version are you playing? Yea it happened every time. I figured out that this happens when crouching on half blocks (stairs, slabs). This will be fixed in the next release. Can you localize messages or publish source code for community to do it? I can work on localizing the messages. Hello, could you add a modpack policy to the description? Thank you! Feel free to use StepUp in modpacks. Is now stated at the bottom. I love this mod. I've been using it since 1.7.10. It's one of the first I ever downloaded and is still one of my favorites. Here's my showcase video. When running this mod together with the Dynamic Surroundings mod, an error occurred while reloading a savegame. Someone looked at the decompiled source of the mod and can see where a variable Stepup is using is not initialized which in turn would cause an NPE (StepChanger.java, line 56 - "firstRun" is not properly initialized). It appears to be a bug in StepUp. Noted. I'll get to this when i can. Thanks. One question: Is there a possibility you add a 0,6 block height step up? What version of StepUp are you using? For minecraft 1.10+ StepUp uses 0.6 stepHeight.